Beautiful at first sight, Seraphim Classics Angels reward the collector with continued delight. Little wonder that the Seraphim classics became America's best selling angels shortly after their introduction in 1993. Make your selections and place your secure order from our on-line catalog. Pay with credit cards on line or by fax. Mail your order with check or money order. Most orders will be shipped within three working days. Click here for more shipping information. 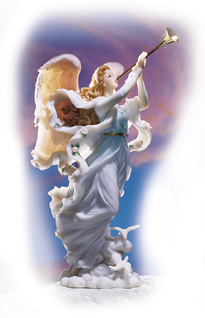 There are more than 100 angels in the Seraphim Classic Collection. Click on a collection title below to view angels in that collection. These masterworks are produced for only a short time before they are retired. Each carries a numbered understamp and certificate of authenticity. You will want these for your collection, so be sure to order prior to the closing date. Five angels form an oasis of serenity as they admire the surroundings of a peaceful pond. This dreamy scene has been created in honor of Seraphim Classics® Fifth Anniversary. It Retired in June of 2000. Limited quantity available so order now. These extraordinary decorations possess all the detail and charm of the full-size Seraphim Classic® figures. Miniatures of the most popular larger angels, they are the perfect gift for those you love.